Large, illustrious busy Campo Santo Stefano is a major crossroads near the Accademia bridge . For centuries it was planted with grass except for a stone avenue called the liston. Even today Venetians say 'andare al liston' for 'to go for a walk'. And in the old Venetian city of Corfu, liston survives as the name for the main promenade. In the bad old days the big grassy space hosted bull and bear-baiting games—until 1802, when the crush of spectators caused the stands to collapse, killing several people. 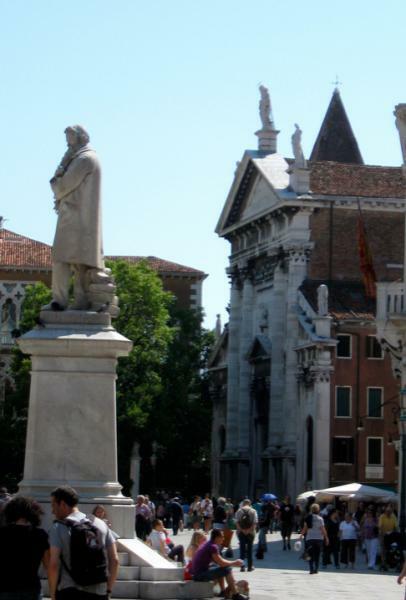 The bulls have been replaced by a statue of Risorgimento scholar Nicolò Tommaseo, whose pile of reading matter rising up behind him has earned him the nickname 'Caga libri' or book-shitter. He is watched over by several palaces: Palazzo Morosini on the east side (No.2802), home of the battling Doge Francesco Morosini, and, across the campo, the long classical façade of Palazzo Loredan (now the Veneto Institute of Science, Letters and Art), with its seaworthy door-knocker by Alessandro Vittoria. Opposite San Vitale on the southern side of the campo are the high iron fences of the Palazzo Franchetti, ornately restored in the 19th century, and one of the few palaces on the Grand Canal to have its own gardens. Turn left into Ramo della Piscina. The next corner offers a choice of short digressions: on the right, Calle Corner o del Magazen Vecchio leads to the charming Corte Corner, with a Gothic palace and Veneto-Byzantine well-head, while to the left, on Calle Crosera, you can see the curious shoe (high heel, of course) carved in the old Scuola of the Shoemakers at No.3127.